In the hotel, I met up with Frank, a German guy who'd made it across the Sahara alive -- although "hotel" might be a little strong. Actually, it was a mattress on the roof at night, but since it was 117° during the day, cooling off at night was a good thing. 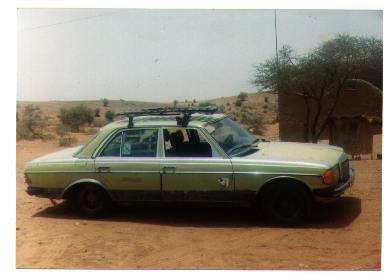 We took the Mercedes across another 600 km of desert from Gao to Niamey, Niger. On the way, we broke down at least once a day, mostly because of the conditions - the "road" is just a general track or path that most vehicles use. Sometimes it's blown away. Sometimes it's flooded. Sometimes it swallows vehicles whole. I got seriously ill (amoebic dysentery if you must know), which was particularly nice, as we spent several nights sleeping in the desert on a blanket (there are no roadside motels in a desert, and forget triple-A). Once, at almost noon on a clear day (every day is a clear day in the desert), the wind picked up and we were caught in a sandstorm. In the space of 60 seconds, the sky became pitch black and we came to complete stop. Headlights don't work in a sandstorm. Within 15 minutes, the sky was clear again. It was like a wave of dark wind washing over us. But the main trick to driving in the desert (so I'm told) is to try and keep going at least 60 miles an hour no matter what absolutely until you reach a hard spot, or you'll sink into the sand and won't be able to keep moving. The concept of a border is strange in the desert -- for hundreds of miles in any direction, there's nothing but sand and rock. Suddenly, you come upon a small collection of metal shacks and block buildings - a military outpost. 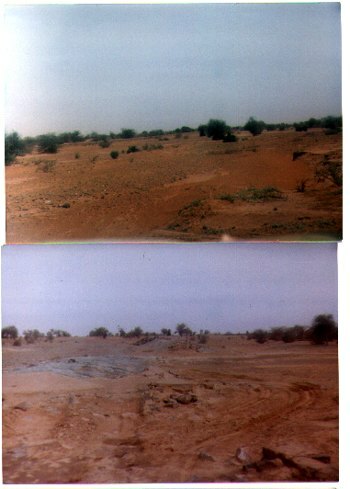 On your right, the Niger River, where hippos wallow on the banks and ply the waters, bellowing in a sort of angry cow-like way at all hours. By the time we made it to the border, my visa for Mali had expired. And it turns out you can't get a visa for Niger at border. So they couldn't kick me out, and they wouldn't let me in. You see, there are no phones in the desert. In fact, there is no way to communicate with the outside world at all. You simply wait for a vehicle to pass by, and try to get a ride. When's the next transport? Maybe tomorrow. Maybe next month. The fact that the rebels regularly held up buses and shot at the military outpost doesn't help much (the guards pointed out the recent bullet holes in the buildings). 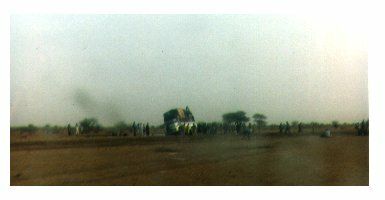 I was detained by the Niger border police for 3 days. Did I mention I had amoebic dysentery? This is one of those profound moments that's difficult to put into words, one in which you realize that you have completely disconnected from the world you know. There are no doctors. There are no consulates. There is no one at all that you can turn to. And your fate is in the hands of men with machine guns, men who do not speak your language. It is a moment in which you see with crystalline clarity how incredibly much we take for granted every single day.